Fig. 4. 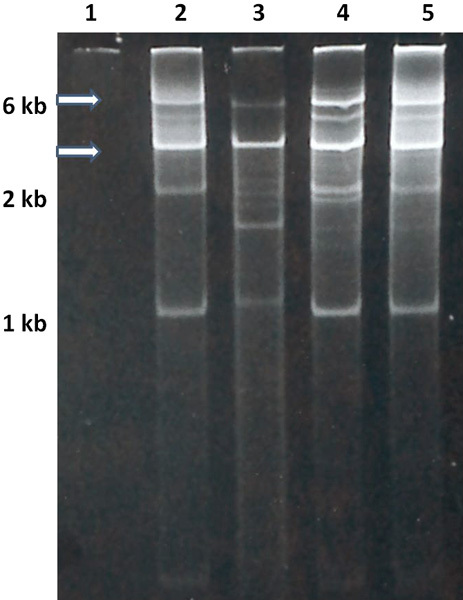 Polyacrylamide gel electrophoresis (5%) of dsRNAs extracted from leatherleaf fern (LLF) and Japanese holly fern (JHF) plants. Healthy and infected LLF plants are in lanes 1 and 3, respectively. JHF plants infected with different isolates of JHFMoV are in lanes 2 (JHFMoV-JM), 4 (JHFMoV-DI) and 5 (JHFMoV-CA). Arrows point at the two major (6.2 and 3.0 kbp) dsRNA bands.